Located in the northwest corner of Utah. approximately 32 miels west of Brigham City. May 10, 1869, two railroad companies, Union Pacific and Central Pacific, joined 1,776 miles of rail at Promontory Summit, Utah Territory. This event sparked unforetold consequences still reflected in our great nation today. Golden Spike National Historic Site commemorates this incredible accomplishment of the completion of the first, transcontinental railroad. 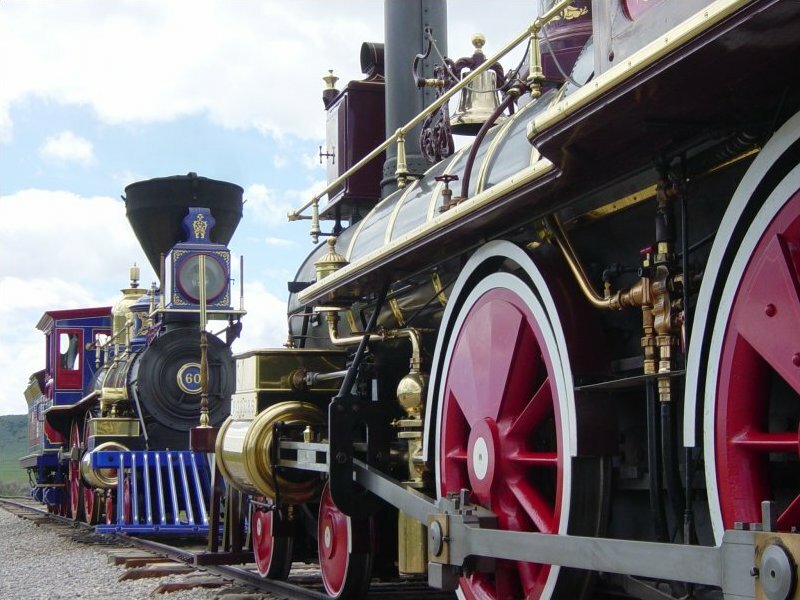 Golden Spike National Historic Site is home to the steam locomotives Jupiter and #119. These engines are fully-functional replicas of the original locomotives that met here on May 10, 1869, for the "Wedding of the Rails Ceremony"
Re-enactments are every Saturday (11 a.m. and 1 p.m.) from the first Saturday in May through Labor Day. Other re-enactments may occur throughtout the summer. Interested in horse-drawn vehicles? You won’t want to miss the largest private collection in the West. Eli Anderson, a resident of Tremonton, loves horse-drawn vehicles. He loves to collect them; he loves to display them; he loves to talk about them. If you'd like to see his truly excellent and varied collection while you're in the area, call to make an appointment. Highway 89, between Willard and Brigham City, offers beautiful country and orchard-fresh produce sold at roadside stands. Once large shipping center for the Union Pacific, it is now an educational center for railroad history, providing entertainment and learning for the whole family. Settled in 1889, Holmgren Historical Farm is home to barn dances in a majestic barn, quilt shows, artists in the garden, music festivals, and fine gifts. Stop by for a free of charge tour. In Willard City, south of Perry, along the famous “Fruitway”, and at the base of Willard Peak, there is located some historical architecture that is unique to the British Isles immigration to Utah. It is what brings the taste of Wales to what was then the Western Frontier. Found here is the greatest concentration of Welch-styled stone houses anywhere in Utah. These charming private residences were built by pioneers and are now a part of the picturesque scenery on the drive between Brigham City and Tremonton along state road 38. An absolute must-see. For tour information, call 435-734-0332. Come and experience the unique and varied cultural heritage found within the Bear River Basin of Northern Utah and Southeastern Idaho. This website is your guide to a fascinating variety of natural, historical and cultural experiences. Let us share how this land and these people have enriched our lives. Visit us at www.bearriverheritage.com.